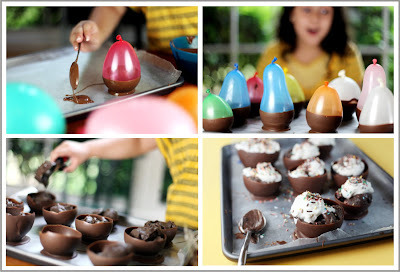 I've been on the look out for cute/clever ice cream bowls for the kiddos birthday parties coming up. This morning I wanted to quickly skim over a few of my favorite blogs. Seriously, if you haven't looked or drooled over at Bakerella lately you have to check these out. How fun and yummy! I'm not sure if I will make these for the kids parties because there will already be too much sugar envolved. The parents would just luv me, right? They would however be perfect for a little get together. Can't wait to try. I know the kids will love to help me out with this one! Holy moly that looks yummy... I can picture some sort of mocha mouse or something in there. Damn, now I'm drooling.